As I mentioned in a recent post, I will soon take on a more public and impactful role in the wider infertility community through volunteer efforts with an organization whose mission is focused on infertility awareness, support and advocacy. Outwardly, my volunteer efforts will focus on helping other people who are experiencing infertility, however, my motivation for taking on this role is not purely altruistic. Aside from all of the usual benefits that people get from volunteering their time, I am hoping that this more public role will force me out of my comfort zone and get me talking more about infertility, and my own experience with it in my day to day life. While living with infertility, I did not like to share many details about what was going on with friends and family. I was always honest when people asked if I wanted kids, and would freely share that we were trying, but that was usually the extent of it. As I have written in earlier posts on this blog, the reluctance to share many details extended even to other people in my social circle who were also experiencing infertility (though in this case, the reasons for not wanting to share were much more complex). The sad thing is that I think at the time, my instincts were correct, and I was emotionally better off by not sharing. Even now, when I am sharing my experiences with others who are in the midst of their own infertility struggles, if the topic of being more open with their broader social circle comes up, I generally advise that the less said the better. Instead, I give them ideas of how they can connect with other people also experiencing infertility, or steps they can take to protect their emotions from the repeated painful reminders that being infertile in a fertile world can bring. Unfortunately, infertility remains one of the last taboos. Probably the closest analogy I can think of is the perception of mental illness, yet I think even mental illness has come a long way in the last ten to twenty years in terms of public awareness, and acceptance of the mentally ill.
All of these factors lead to a vicious cycle: the general public has many misconceptions about infertility; as a result, infertiles who choose to share their struggles find themselves facing ill timed or intrusive questions, or receiving unsolicited advice from caring friends and family who are trying to be supportive (not to mention much worse from others who may not be as well meaning); leading to infertiles deciding they are safer to keep quiet about their struggles; resulting in an uninformed public and the continuing taboo. There is the odd person who has the emotional and mental make-up to take on the role of advocate while in the midst of their own struggles, however for most people, I think it is more realistic to advocate once their own infertility is resolved (however that resolution may happen). Therefore, I strongly believe that in order to break the vicious cycle, and properly educate the public about infertility, it is up to those (like myself) whose emotional resources are no longer drained by infertility. And yet, despite promising myself that once I had Baby Boy I would be more open about what we went through and share my experiences with friends and strangers alike, to date I think I have failed miserably. The reasons for this failure are many. I am generally at peace with my own experience with infertility. Yes (as I explained in a recent post), the scars are there, but they are just that – scars. Infertility is no longer a gaping, weeping wound, nor even a fresh scab that can easily be picked to bleed again. It depends on the day, but I would guess that it has an impact of 5% to 10% of what it used to (and much of this is actually due to the positive after effects of infertility, which I also described in the aforementioned post). Therefore, I think I am in an excellent position to advocate and share my story every chance I get. However, the reality is very different. When I do bring my experiences up in conversation, I tend to keep it vague – I say that “it took us a long time”, or maybe (the odd, odd time), I admit to doing “fertility treatments”. And while I wish that I took every available opportunity to share even this amount of information, I usually only bring this up when I suspect that the person in front of me may also have experienced (or be currently experiencing) infertility. And when I share even these fairly neutral statements (from behind my current shield of motherhood, and growing pregnancy belly no less! ), my stomach is clenched and my heart is racing, and I feel completely naked and exposed. Therefore, I completely understand why infertility remains a taboo topic, because despite my best efforts so far I have not been very successful in doing my small part to change things. I am looking forward to what I hope will be growth and healing as I take on my new role, and slowly, step by step become the advocate I’d always hoped I could be. I haven’t posted much lately, and I never did write about the follow up appointment after our first transfer failed. As a result, I haven’t written much about this cycle, or the plan if it doesn’t work. So, I’ll start with a brief synopsis of where we’re at. As I wrote about in most (all?) of my recent blog posts, I moved across the country in the middle of my two week wait from my first cycle. We had an appointment with a clinic here in Toronto lined up just in case the IVF did not take, which took place in early August. A few days later, we had our WTF appointment with the RE in our old city. I did write a draft of a post describing in some detail how it went, but in a nutshell what came out of it is that we still don’t know why we’re not getting pregnant (via IVF or otherwise). 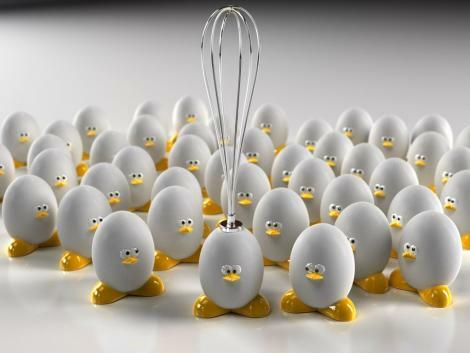 So, the diagnostic aspect of IVF did not give us any answers, other than to say that both egg and sperm quality are great, and we make lots of very good looking embryos. We decided that for this FET, we would do our monitoring appointment in Toronto, and fly back to our old clinic for the transfer. If this does not work, we are considering shipping some of our embryos to Toronto to do our next cycle here (probably 2 out of the 5 we have left – I’m still nervous about shipping them, as is my old clinic). Our RE already pulled out most of his tricks on us with the first FET, so not much changed in the protocol this time around. We did the intralipids and heparin again, but did add a steroid to the mix. These things should help us with any undiagnosed immune or otherwise weird implantation type issues, because that’s really all that’s left. 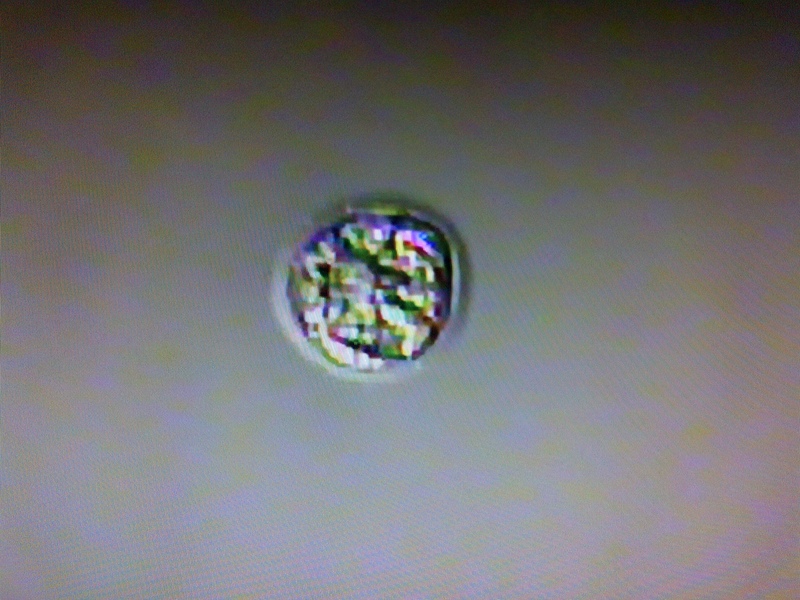 And we decided that after only transferring one embryo last time that this time we would transfer two. While overall, I would say my RE treats aggressively, he is conservative when it comes to the number of embryos to transfer. Wherever possible, he recommends a single embryo transfer, especially if it’s a day 5 transfer, and the blasts are high quality. As much as possible, he wants to avoid multiples, and I tend to agree with him. I want my next pregnancy to go smoothly, with as few complications as possible. I’ve already had a pregnancy that did not go well (miscarriage), and one that never really started (chemical), so I want to do whatever I can to ensure that the next pregnancy makes it. While I understand that there is only so much you can do on that front, one guaranteed way to increase your risks across the board is through a twin (or higher) pregnancy. Pretty much every possible risk, from incompetent cervix, to preeclampsia, to premature birth is magnified when you have are carrying more than one baby. Many women pregnant with multiples end up on bedrest for a significant portion of their pregnancy in order to try to manage these risks, which must just magnify the stress. And the risks don’t end with pregnancy – babies born prematurely have more health issues, some of which can be lifelong problems. For example, cerebral palsy is ten times more common in twin pregnancies than in singletons. And lastly, there are what my RE described as the “psycho-social risks” once the babies are born, and the parents are overwhelmed dealing with two (or more) babies who both have the same needs at the same time. Based on all of that, I was happy to transfer one embryo the first time around. But, when that didn’t work we had to decide whether to up the stakes this time. My husband was all for it, but it took me a while to come around. I had been worried that if our first transfer did not work I would regret only putting one back in, but in the end I was at peace with our decision. I know that we did the right thing by only transferring one embryo, and if I had the chance to do it over, I would do the exact same thing. However, the decision about how many to transfer second time around was much harder. I asked our RE what he recommended, and while he wouldn’t come out and recommend we do two, he did say he understood why we would want to try two this time around. In the end, I did some crude math and decided I was willing to take my chances with two. Probably the biggest factor was thinking about the possibility that if we put one in this time around and it didn’t take, we’d be looking at another failed cycle and heading to a third transfer. If the third one took though, it’s a result we could have achieved earlier by transferring two this time around. And emotionally, I think there’s a big difference between being successful on the second transfer vs. having two failed transfers under your belt and having the stress mount that things aren’t going to work out. Yes, I’ll admit it, I’m getting impatient. A related consideration was miscarriage risk. Again, if we put one back in and miscarried, it’s a very different story than putting two back in, having a vanishing twin, and still ending up with a healthy baby. And this time around, my desire to get pregnant first and worry about the consequences later outweighed my desire to minimize pregnancy risk. When we got to the clinic for our transfer today, our RE sat down with us to talk about our embryos. As in our first transfer, our embryos thawed perfectly. Once again, we heard that they looked like they had never been frozen, and once again both the RE and embryologist gushed about how they couldn’t look more perfect. We went into the procedure room, where I changed and got ready for the transfer. The embryologist then told us that this morning when the embryos were thawed, our RE had started to wonder whether we should really be transferring two, since they looked so good and he felt they had a high chance of both implanting. Sure enough when he came into the room, he asked us whether we were sure we wanted to go ahead with two. He offered that we could transfer one and refreeze the other. It was not an easy decision, but we talked it over and decided to stick with the plan. Hopefully no matter the outcome of this cycle, I’ll look back on this as the right decision. In the meantime, for the next twelve days I’m pregnant until proven otherwise. Part of the reason for it is the usual “to busy to post” excuse. My husband was wrapping up a few final things in our old city, and he finally came back for good last weekend. My evenings since then have been busy, and since I started my new job, I’ve been pretty careful about my internet usage at work. At my last position, I was self employed and used my own laptop. We didn’t have an IT department, so I knew nobody was monitoring my internet usage in any way. Here, I have a company computer that is logged on to a network, therefore I don’t feel like I have the same freedom to surf the internet, and in particular, post on my forums, or write my blog (I think facebook and twitter are outright blocked). This is not really a bad thing, as it keeps me focused on doing my job, and if I really need a fix, I can check stuff out on my blackberry. But, at the same time it does limit the time I have to update my blog (I used to write a lot of posts during lunch). So that’s part of the reason for my absence. The other part is more complicated, but in a nutshell, I’ve been feeling like a break. While for the most part, writing the blog has been therapeutic and a great outlet for getting my feelings out, the act of writing also forces me to focus on the unpleasant part of what is, for the most part the fantastic life that I’m living (especially recently, with our move back to Toronto). It’s a fine line, and for the last few weeks, living my fantastic life and trying not to get sucked into the infertility negativity has won out. I’ve still been checking twitter, and the two infertility forums I belong to, but less so, and staying away from posting much of anything. While all of those have been wonderful sources of comfort for me, sometimes I feel like it can get to be too much. Logging on and seeing the raw emotions people are feeling over whatever stage they’re at in their infertility journey has a real emotional impact on how I’m feeling. Often it’s because they’re going through things I’ve experienced (miscarriage, failed cycles, unexpected delays, etc.) and seeing their posts makes me re-live those difficult moments, while other times it’s things I have not experienced, and hope never to have to deal with. But, in any case, seeing so much grief wears me down sometimes. On a related note, it seems like in the last few weeks I’ve spoken to too many frazzled parents, as my husband and I have started catching up with our friends in and around Toronto, many of whom have young children (3 and under). They are all good parents, and wonderful people, but they all expressed some level of frustration and stress about the demands of parenting, and having to juggle that with everything else in their lives. None of this was said in a “Woe is me” way, and not once did any of them suggest we were lucky for not having to deal with these things. These were just frank conversations between friends, and I understand where they’re coming from. We were at a wedding last week, where many of these conversations took place, and as my husband and I were dancing the night away (long after most of our friends with kids had left to go home and relieve their babysitters), and getting everyone caught up on our exciting new house and exciting new jobs, for the first time in a very long time (well, since we started fertility treatments a year and half ago) I felt like taking a break and not worrying about anything to do with infertility or treatments for a while. And then a few days later, I got my period, which meant it was time to get my frozen embryo transfer (FET) cycle going. And then my clinic told me they needed some updated bloodwork for me, and since it was already day 3 of my cycle, I had a minor panic attack that it may be too late to get the bloodwork done this cycle, which meant I would have to postpone this cycle until November (since I was away for two weeks in October), and just like that I was sucked back into the madness. Fortunately, the bloodwork my clinic needs can be done any time of month, so things are a go for an FET this month and now I’m starting to count down the days to my monitoring appointment, my transfer, and my beta day. I seem to be suffering from a touch of infertility amnesia this month. Coming off my IVF cycle which took four months for one very precisely timed shot at conception, to all of a sudden trying naturally again this month makes me feel like I’ve rewound my infertility history by several years. I am once again charting my temperatures, peeing on ovulation predictor sticks, and monitoring my vaginal secretions so that my husband and I can ensure we are giving egg and sperm the best possible opportunity to meet. I am paying attention to what my acupuncturst says, studing the Cooking for Fertility cookbook I borrowed, and reviewing my Yoga for Fertility book once again. For some reason, I am seriously embracing all of these things which have failed me in the past, as if one of them might actually make a difference this month. Last week, I even ran around to several stores trying to get a tube of Preseed, the sperm friendly vaginal lubricant, since I was worried I may be approaching ovulation with very scant amounts of cervical mucuos. I don’t know what got into me, but I felt that I just had to get my hands on some Preseed, or else this month was doomed for failure. I’m not sure what to call this. Hope is too strong a word – I don’t really expect to get pregnant this month. But at the same time, it has been a very long time since I took a natural cycle this seriously. I think there must be something invigorating about experiencing the contrasts between having a highly controlled medicated cycle, and a good old fashioned roll (or 4) in the hay. And this works both ways – a “break” from treatments usually ends up being more welcome than I would have thought, and yet I am always happy to be moving on to the next medicated cycle where I feel like I actually have a chance. And thankfully this time around, the next medicated cycle is just around the corner, with our next frozen embryo transfer planned for September. Well I never did write the post that was to be my rant against the Ontario health care system on Friday, or yesterday. Instead, I ran out of time, and out of steam. I’ll try to do a quick summary of the ordeal that getting my pregnancy test results was, and then I’ll move on. In case, there’s any doubt, my negative pregnancy result was confirmed via bloodwork. I got the confirmation on Friday, but it was quite the production. When I had my transfer, my clinic had warned me that the lab in Ontario may not accept the requisition they wrote for the pregnancy test, in which case I would have to go to a walk-in clinic to get a requisition from a Dr. here. Sure enought, that ended up being the case, so after going to the lab, I went to the closest walk-in clinic, got the requisition and figured it would be smooth sailing from there. Wrong! I had written on the requisition that test results should be copied to my RE (in my old province). However, the woman in the lab told me that they couldn’t send results to my Dr., as they were only authorized to send results to Dr.s in Ontario. It would be up to the Dr. here to forward my results on, but she warned me that it was totally up to his discretion, and that he may not do it! I was absolutely shocked at this. I understand that the lab has rules they have to play by, but for a Dr. to withhold test results from the medical professional who had ordered them in the first place (simply because they practiced in another province) seemed unfathomable to me. But, it got worse. I was then told that results would not be available for 24 hours, and therefore I would have to wait another day for confirmation. I was once again shocked, as I was used to same day results, and had never considered I may not get them here. I was in Canada’s largest city, getting routine bloodwork done minutes away from the largest concentration of hospitals and medical facilities in Canada (and I’m sure sure one of the largest in North America), and I had to wait 24 hours for my results?? Meanwhile, I just wanted to get closure on this cycle so I could start to move on and plan next steps. I was so upset by all this that I started tearing up as the lab tech was taking my blood. She noticed I was upset, which somehow made it worse, and I ended up flat out bawling. She saw how upset I was, and said that I could call the clinic to see if they would provide a new requisition that was marked “urgent”, in which case the results would be ready in three hours. I considered this, but decided that at this point I needed the path of least resistance, and so would just wait until tomorrow for my results (especially as I didn’t think I would be able to get two words out to the clinic without crying). However, the lab tech somehow convinced me to call, promising that the receptionist at the clinic would be able to help me, and I wouldn’t have to drag myself in to see the Dr. again. I called the clinic, and ended up speaking to the Dr. who informed me that they do not do “urgent” requests for pregnancy blood test results unless it’s a suspected ectopic as it would unnecessarily tie up resources. I told him fair enough, but the reason I was requesting it was because I was used to same day results in my old province and that the lab tech had suggested I request an “urgent” rating in order to get that. The Dr. finally relented and said that while he couldn’t code my requisition “urgent”, he could do an “ASAP”, in which case results may be ready earlier. I then asked if he would send the hard copy results to my RE for his file, and the Dr. here said he wouldn’t (again, something about wasting resources). I was flabbergasted, but stayed calm and explained that my RE would require written confirmation of the test results over and above my verbal confirmation that the cycle was negative, and how would I go about making sure he got that confirmation? The answer to this was that I would have to go back into the clinic on Saturday to get a copy of my results, which I could then fax to my Dr. myself. Again, this was incredibly frustrating. Not only would this be another painful step for me, and take up my time, it also meant that other patients with legitimate medical concerns would have to wait while the clinic served me again. The Dr. ended up speaking to the lab tech directly, and when she hung up, she assured me I would have results that day. I was not convinced, but called the clinic just before they closed and got my confirmation. I dragged myself back to the clinic on Saturday, asked reception for a copy of my test results, was told they weren’t signed off by a Dr. yet, so I would have to see a Dr. before I got them. I then waited half an hour in the overflowing waiting room to see a Dr. for one minute so he could sign off on the results and give me a copy. I then went to a Grand and Toy down the street and faxed the results to my clinic. Finally, over 24 hours after first going to the lab for bloodwork, my fertility clinic had the results. I am back from my pregnancy blood test, and may or may not get results today. That said, the results are just a formality, as I already know what they will say. I took my last pregnancy test today just to confirm the earlier negative results. I am 11 days post a 5 day transfer, so even with late implantation, etc. if I had a viable pregnancy, my First Response Early Response pregnancy test would show a positive. So I am expecting a flat out negative, but based on my previous chemical pregnancy where my beta hcg was only 11 (or too low to be picked up by a home pregnancy test) I realize there is also the possibility that my bloodwork could show a low positive. Don’t get me wrong, I’m not holding out “hope”. When I had my chemical pregnancy, I did a ton of reading about starting out with really low hcg levels, and saw there was virtually no chance that starting out that low would result in a viable pregnancy. While I came across enough stories about “low” betas resulting in healthy, bouncing babies 9 months later, they were betas in the 20’s or 30’s, which of course my home pregnancy test would have picked up this morning. The only reason I mention the possibility of a low positive scenario, is to provide context for why I am anxious to have the pregnancy results today; so I can officially get closure on this cycle, and know how it ends – whether it’s the likely BFN (Big Fat Negative), or the less likely, but still possible chemical pregnancy scenario. I want to know what my “stats” are, as I start to plan next steps and make a list of questions I will ask the Dr. at my follow up consult next week. Assuming I still have the emotional energy, I am planning on writing my next post about the complete nightmare that the simple act of getting my blood drawn this morning ended up being. But in order to do that, I need to provide some additional context, which will be very difficult to provide if I continue with cloaked references to my “old city” and “new city”. When I started this blog, I was very careful to leave out any details that would reveal my identity if someone who knew me happened to stumble across it. It was (and still is) very important to me that I could write what I want about who I want on here, and be comfortable sharing things I wouldn’t share in person with people I know, without worrying about someone I know reading it and connecting the dots. So aside from the obvious things like not including my real name on this blog, or posting pictures of myself, I have taken the less obvious steps of connecting this blog with its own email address, instead of the one I normally use, and not even revealing where in Canada I lived. I really don’t get enough internet traffic to warrant this level of paranoia, but it made me feel good knowing I had multiple layers of security in place to keep me safe from prying eyes. That said, having recently moved from a smaller city, to a bigger city, I had already been considering at least sharing where it is I now live, as millions of other people live here too, so I no longer feel like sharing that information would really reveal anything personal about me, and it’s easier to just share where I am instead of constantly saying “new city” or “where I live” etc. etc. While many would argue that the place I moved from is large enough that sharing that location would likewise not be any sort of big reveal, over the years that I lived there, I experienced too many strange connections/coincidences to give me comfort that I could remain anonymous if I shared where it was. Despite being one of Canada’s major (or at the very least semi-major) cities, over and over again I came across situations which proved to me how small and tight social circles there could be. In many ways it felt like a much smaller town than the population would suggest. 1. Shortly after moving there, I started to cultivate a friendship with one of my coworkers. When we discussed where I live, it turned out that her husband’s ex-wife lived in the same 8 unit complex as us (2 doors down, I believe). 2. Around the same time, my husband connected online with someone who was putting together a band and looking for people to jam with. Soon enough, we found out that one of the singers in the 8 person band worked at my work (not the same office as me, but the other office in town). To make it more strange, just the week before I had bid on (and won) a United Way raffle item at my work which she had submitted, for 3 personal training sessions with her. 3. After buying our house, we were telling a friend (actually one of the band members referenced above) about the place we bought and how the old owners had moved to Belize. His wife perked up, and we soon made the connection that she worked with the woman we bought the house from until she moved away. 4. On another occasion, a friend of a friend was driving me home after a party, and when she pulled up at my house, she said “I’ve been here before.” After a few minutes of discussion, we confirmed that she also knew the old owners of our house. 5. Several years later, I was now working at a new job. The office was really small, with just three of us, and me and the guy I worked for were looking for someone to replace the third person as she was going on maternity leave. We hired a keen summer student as a temporary replacement, and when he found out where I used to work when I first moved, he asked if I knew his cousin who also worked there. It turns out I knew here quite well, as his cousin was the friend mentioned in point 1 above. 6. When we went away on sabbatical two years ago, we put our house up for rent. One of the people interested was a yoga instructor. When she showed up to see the house, we immediately recognized each other as she had just subbed in that week for a class I was taking at the new yoga studio I was trying out. She and her friend ended up signing a lease, but due to a last minute change in her friend’s circumstances, had to back out. 7. We ended up renting our house to three other people. One of the roommates was our main contact, however when we met the other two roommates, we discovered that we had another yoga instructor on our hands. This girl taught at the main yoga clinic that I attended, and I’d done many classes with her, so again she recognized me right away. 8. When we sold our house in June, we had another series of coincidences. My husband was trimming the plants at the back of our yard, and chatting with our neighbour in the yard behind us, when the neighbour told us that he met the guy who’d bought our house. Turns out they were at a stag party for a mutual friend, and ended up going back to our neighbour’s place after the party, where the new owner realized he was staring into his new backyard. 9. Several weeks later, we were talking to the girl who bought our place, and she mentioned off hand that her best friend was familiar with our house. She was telling her friend about the place she’d just purchased, and her friend started finishing her sentences. Turns out her best friend is the yoga instructor who almost rented our house when we went away (see point 6 above). 10. And if you’re not sick of the yoga references yet (hmm….perhaps the issue wasn’t where I lived, perhaps it was the fact that I did yoga 🙂 ), after buying our new house, we realized that we would have nowhere to put our hutch/china cabinet, so we listed it on Craigslist. We started getting requests for more information coming in, but nobody seemed interested anymore when we followed up. And then my husband got a hit from someone who wanted to come see the hutch in person. He forwarded the email to me, and I recognized it right away as my fertility yoga instructor’s. (And in case you’re wondering, for good karma, we ended up flat out giving it to her instead of charging her anything for it). So if you’ve stuck with this post so far, hopefully you’ll appreciate that I’m not some nut for not wanting to reveal where I used to live! However, I am comfortable with sharing that as of last week, I live in Toronto, Canada’s largest city. I have been waiting for this day for months…after starting birth control pills for IVF on March 29th (which only happened after I’d been taking DHEA for about 10 weeks to help my eggs be at their best), we finally transferred one beautiful embryo (MB) today! My lining check last week went great – my lining was “absolutelty beautiful” at 8.5mm and exhibited the coveted “triple stripe” pattern, which meant we could do the transfer any time this week. I had an intralipid infusion after the lining check, and added doxycycline, heparin, and prometrium to the estrace that I’d been taking for the last few weeks. Last night, I enjoyed my last run and bath for at least two weeks (five if I’m pregnant). Going into this frozen cycle, we had already made the decision to transfer only one embryo. I’ll probably write a post about this decision at some point, but for now I’ll just summarize by saying that since our embryos were high quality, and this was our first IVF transfer (due to the OHSS which prevented us from doing a fresh transfer last month), we thought it would be better to err on the side of caution and just transfer one. Our transfer was scheduled for 12:30, but we were told to be at the clinic for noon. In order to kill some time this morning, I decided to do a yoga class 9:30 to 11:00, which was super relaxing. However, it was a half hour walk home, and it was a little later than I would have liked by the time I got out of there, so I sped walk the whole way, so we wouldn’t be late getting to the clinic! Oh, and my husband told me he woke up with some crazy neck pain that got progressively worse and caused shooting pain to go down his neck periodically, so he could barely drive. At 11:30 (one hour before planned transfer time), I dutifully drank my litre of water to fill my bladder. I was looking forward to hearing how our embryo had done in the thaw. Since we had 8 frozen, I knew that if something happened to one, we had others we could try. I also wasn’t too worried, as our Dr. had explained that with the new flash freezing method (vitrification) that the clinic uses now, embryos do much better at surviving the thaw than in the past. When we arrived at the clinic, our Dr. told us that our embryo looked perfect! The embryologist confirmed this, saying that it was as good coming out as it had been going in, and looked like it had never been frozen. It was a grade 19 blastocyst, which is super (our clinic grades out of 20, with 20 rarely given out, so 19 is considered very high quality). 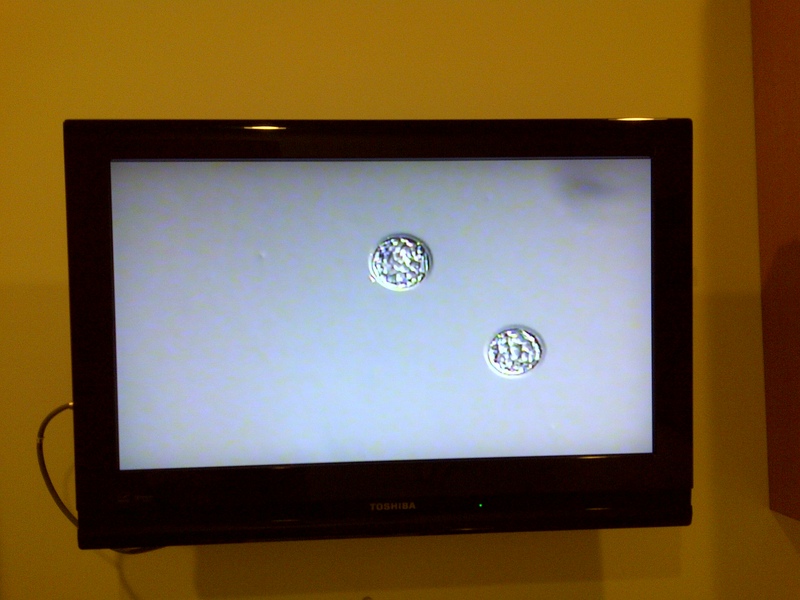 Once we were ready to go, a picture of our embryo appeared on the large screen tv in the room (we took photos of it afterwards – one of which is shown on this post). I couldn’t stop staring at it – it really was beautiful! We were able to watch on the ultrasound screen as the embryo went in the cathether and the catheter deposited it in my uterus (though to be honest, I couldn’t really see too well what was going on). My Dr. had some music by Don McLean playing – can’t remember the song now, but it was mellow and relaxing. At the end, the embryologist checked the catheter (actually two – an inner and outer one), to make sure the embryo wasn’t still stuck in there, and then we were done. I had to lie down for 15 minutes, and our Dr. said that the image of our embryo would stay on the tv for the next 10 minutes, so we could take pictures of it if we wanted to. After the staff left, my husband and I kept staring at the screen. He took a few pictures with our cellphones, including a picture of him and MB together. I think both of us were pretty emotional. Finally the image of MB disappeared off the tv screen. After lying down for a few more minutes, I went to the bathroom to empty my bladder, and then lay down in another room where I took up my Dr.’s offer of some post transfer acupuncture. This took another half hour, and then I got my post transfer instructions and we were good to go. My pregnancy blood test is on Friday the 29th. Technically, it should have been on Saturday, but since that’s the weekend my clinic is having me do it one day early, which is fine by me. I know the next two weeks will be stressful, and of course that we may not get the outcome we want, but for now I can’t help but feel happy and hopeful that we made it this far and that everything couldn’t look better at this stage! Tuesday June 28th was supposed to be the big day when I went for bloodwork to find out if the IVF was successful. Of course, I would have done a home pregnancy test (or several) beforehand out of curiosity, and to have a heads up on the news, but regardless, the 28th was the official date. However, since we didn’t end up transferring any embryos due to OHSS, instead of finding out whether things were successful or not, I went in to the clinic for a day 2 ultrasound and bloodwork to see if we could go ahead with the frozen embryo transfer in July. Originally, I’d thought it would be a no brainer to do the transfer in July, but when I spoke to one of the nurses after getting my period, she scared me by saying that we had to make sure my ovaries were back to a normal size before going ahead, and if they weren’t we might have to wait out a cycle and transfer next month! This totally freaked me out, because I’m moving across the country at the end of this month, and if we don’t transfer in July, I would have to wait until September at the earliest since I wouldn’t be able to take time off work from my new job in August to fly back here for a transfer. Thankfully, the ultrasound went well, and my ovaries had gone right back down to whatever a normal size should be. However, my bloodwork still had to check out okay before we could proceed. I anxiously awaited the call from the fertility clinic, and finally got the news that my bloodwork was “good”, but I had to come back in for more bloodwork again the following day since my estrogen levels were still too high! I tried to tell myself that at this point we were just looking at a delay of a few days, rather than a few months, but the following day I was once again nervous and anxious about what the news would be. Thankfully, my hormone levels were finally acceptable, and I could start taking the estrace (to increase my estrogen levels?!) in preparation for my transfer later this month. For anyone who’s keeping track, I kicked off this IVF cycle with my first birth control pill on March 29th. It is now 3 months later, and while a lot has happened, I have yet to experience even the possibility of being pregnant. I suppose that technically the IVF cycle is over now, and July will be a new cycle, but to me it won’t be over until I do the transfer. Things will be pretty quiet for the next little while as I’ll just be taking my estrace until I go in for an ultrasound and bloodwork on July 13th. If all goes well (as I think it should – the main purpose of the ultrasound will be a lining check, and my lining is always stellar), then my transfer should be around July 18th. Hopefully it will be worth the wait, but in any case I will be happy to finally have closure on this cycle one way or another! As I wrote in my last post, even though everything went really well with the IVF cycle, I ended up with OHSS so we were not able to do a transfer. When my estradiol levels got very high near the end of the stims, my Dr. had warned me that I was at risk. So, we took all the necessary precautions: coasted (no medication) for two days, triggered ovulation with only 5,000 units of hcg instead of the usual 10,000, and got me some medicine (dostinex) to take every evening in the hopes of keeping the OHSS at bay. My stomach felt quite full and bloated after the retrieval, and on the Thursday after retrieval (2 days later) I remember finding the smell of food quite offensive (and it was pizza, which I love! ), and I didn’t have much appetite for dinner. However, when I woke up on Friday I felt much better. By Friday afternoon though, I was feeling worse than before. I ate a banana at lunch time (the only thing I ate for lunch), and by the time I finished it, I felt like if I ate another drop of anything I would throw up. Again, the smell of food really grossed me out. I wondered if this was what morning sickness and sensitivity to smell feels like when you’re pregnant? I ended up leaving work early because I was just sitting there staring at my computer willing time to tick by, but unable to actually work due to feelng horribly bloated and somewhat nauseous. I went home for a nap, and then it was time for my husband and I to go sign the morgtgage documents for our new house. The bank was next to a fast food restaurant, and again I found the smell of food just wretched. I was popping some tylenols as we went in to see the banker, and she noticed and was sympathetic that I wasn’t feeling well, so things moved along fairly quickly. I wasn’t feeling any better when we left, and within five minutes of being in the car, I could feel my stomach clenching and I ended up throwing up all over myself as my husband couldn’t pull over in time. Can you say gross? I called my clinic’s after hours line when I got home. Ever since being told I was at risk of OHSS last week, I’d read the handout several times, but I didn’t seem to have the typical symptoms that it described. The nurse asked me questions about whether I was short of breath (no), and whether my pulse was pounding in my head (no), which I knew were symptoms of OHSS. Even though the nausea and the food sensitivity were my only symptom, but the end of the conversation when she said to drink nothing but one litre of gatorade per day, to sleep sitting up, and to come in for an ultrasound the next day, I knew that I was likely dealing with OHSS. Sure enough, the ultrasound (on my stomach – a first!) 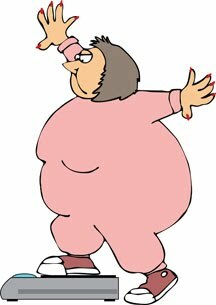 confirmed that I had fluid in my abdomen and that my left ovary was “massive”. Saturday was the worst day of it. Thankfully I didn’t throw up again, but it was very difficult to force myself to eat anything, and I felt very uncomfortable. My stomach was also masive and felt stretched to its limits. And, I was also starting to feel overwhelmed by all the medications I was taking, especially as some of them had to be taken with food, and I wasn’t able to eat much. Between the three times a day estrace pills and prometrium suppositories, the twice daily antibiotic (to be taken with food), the baby asprin, the dostinex, and the twice daily heparin injections, not to mention tylenol for pain, and pepto bismal and gravol for nausea, I felt like my entire day was spent medicating. I even cut out the vitamins and supplements I normally take (my Dr. even suggested it, as they can upset your stomach), and also stopped taking the DHEA, but it was still overwhelming. We went in on the Sunday for an ultrasound, and to make the decision on whether to transfer or not. On Saturday, our Dr. had already asked us when in July we’d be moving, so we knew that we may have to hold off transferring. I felt better on Sunday as my appetite was coming back, but I still felt rough enough that I was hoping our Dr. would say we should hold off on the transfer. And strange as it sounds, when it occurred to me that morning that not transfering would mean I could stop taking all the medication, it seemed like a dream. While I’m sure lots of people would do whatever they can to transfer (even if they weren’t feeling 100%), for me the promise of no more medication was much more appealing than plowing ahead. Over the next few days, I slowly felt better. I had to go for bloodwork a few times, and had a few more ultrasounds, but everything showed that I was getting better. On the Tuesday (one week after retrieval), I did have some tightness in my chest, but it wasn’t too bad And then on Wednesday, I woke up with crazy hearburn (I’d never in my life had heartburn before). It was a constant burning feeling radiating out from my breastbone, and I couldn’t concentrate on anything but the pain. I went into the fertility clinic that morning to get checked out, and everything else looked good, so I got a prescription for something to helpt the heartburn, and was told to stop drinking the gatorade and taking baby aspirin which would aggravate it. Thankfully the medication fully kicked in by the afternoon. On Thursday, I felt better, though I still had some tenderness in my pelvic area, and on Friday I think I could finally say I was 100% – no more big belly or anything! Okay, I was still up the 6 pounds I’d gained over the course of the IVF cycle, but at least I no longer looked pregnant. And then this past Sunday I started spotting, which meant my period was on its way and it was time to jump back in and get going on the frozen embryo transfer!